TELLURIDE – The Telluride Institute’s Talking Gourds Poetry Club begins its fall/winter First Tuesdays season Sept. 1 at 6 p.m. in Arroyo’s with New Mexico poet and cultural journalist Bill Nevins. Continuing its partnership with the Montrose Regional Library, Talking Gourds also will send Nevins to Montrose to perform at the Library’s Open Mic reading series at 6 p.m. on Wednesday Sept. 2nd. Bill was born in New York City, attended Iona College and the University of Connecticut before traveling to Ireland, Spain and Mexico. Settling in New Mexico, he taught at the University and at high schools in Albuquerque, as well as freelancing on cultural issues for several national publications. He was the feature of an award-winning 2007 documentary about a clash with school administrators over his fearless championing of his students’ free speech rights and his subsequent firing, Committing Poetry in Times of War. 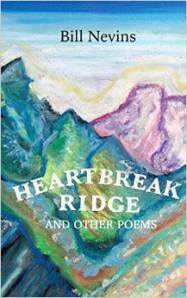 In 2014 Swimming With Elephants Publications published Heartbreak Ridge and Other Poems – dedicated to his son, Liam Nevins, a decorated U.S. Army Special Forces Green Beret killed in Afghanistan. In Telluride, following Club announcements and the featured performance, there will be a short break, after which the gourd will be passed around the room to give Club members and attendees a chance to read a poem or two. The theme for September is “Light”. Bring your own work or that of a favored poet. The fall/winter series continues with Laurie James of Salida October 6th and 7th, and Vonda Harris of Delta and Carol McDermott of Montrose November 3rd and 4th. We’ll be ending the year with the husband/wife poetry team of Ruth Duffy and Michael Olchewsky of Nucla December 1st and 2nd.